Does anyone have “dead space” in your home that becomes a dumping ground? Or should I ask does anyone have an area in your home that has no function and consistently collects clutter? 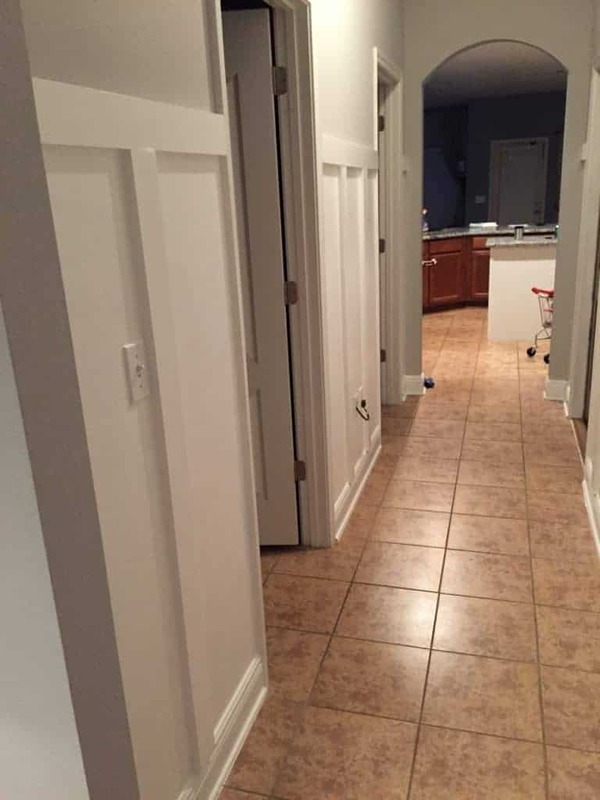 For me, this “dead space” was the hallway right off of our garage entrance that we call our mudroom. 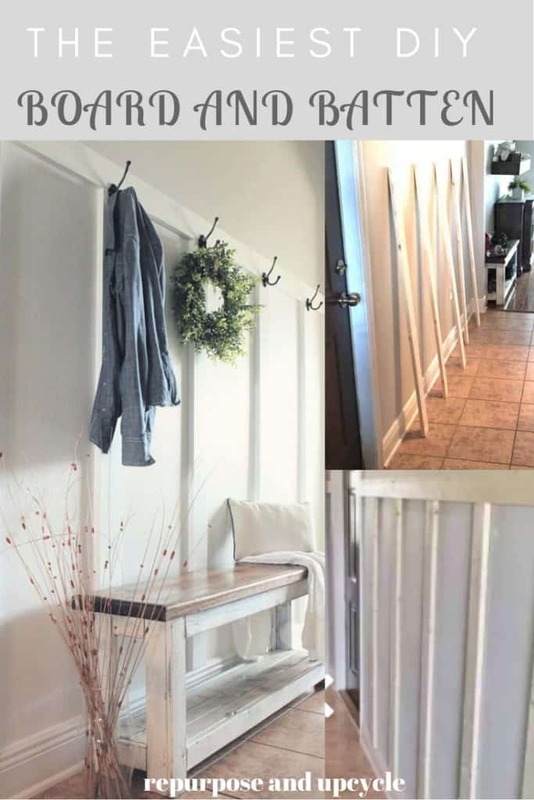 I decided it was time create a little DIY BOARD AND BATTEN for a Modern Farmhouse Mudroom of my dreams! This is my mudroom or hallway on a good day; shoes picked up, backpacks hung, no trash on the floor. 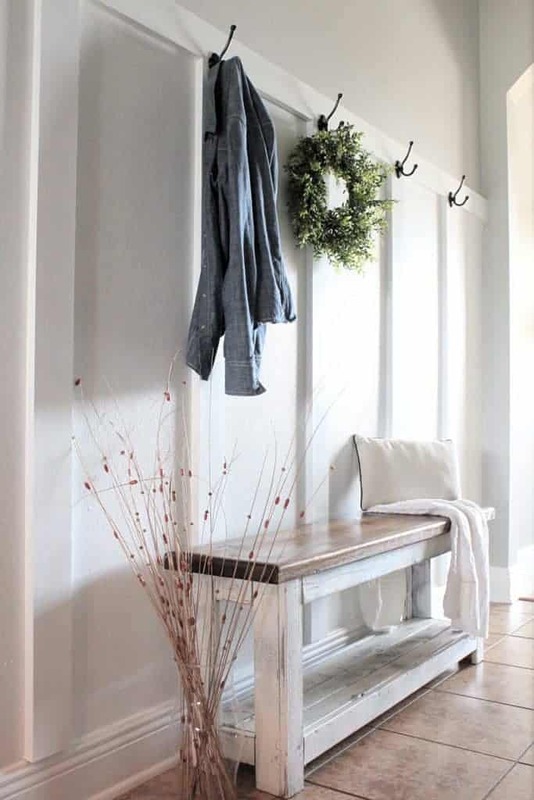 This hallway doesn’t look terrible, just not the “dream” farmhouse MUDROOM look I was going for. All the tutorials I found online were a little too complicated for what I wanted. Like I said, I wanted simple, easy and functional. So I set out to make my own easy BOARD AND BATTEN (or wainscoting) my way, with no frills. 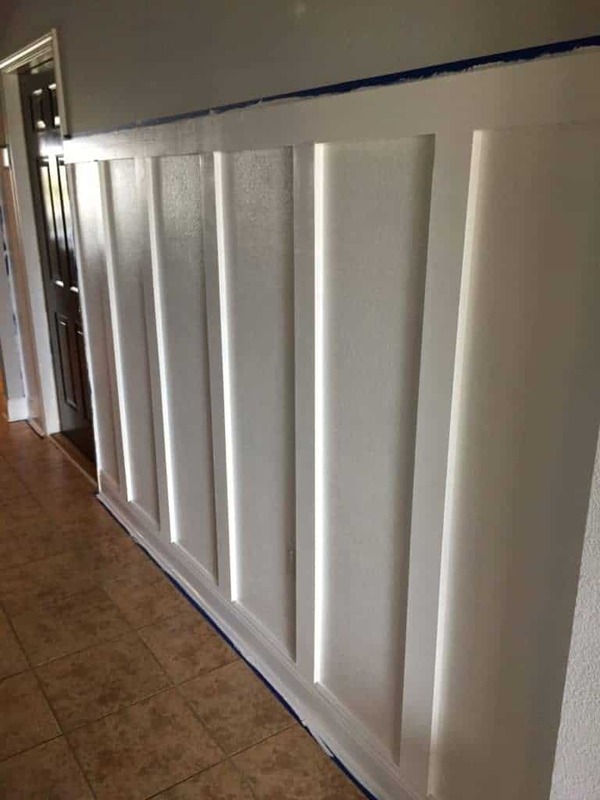 Note: I did NOT want to add the “batten,” I would just paint the walls the same color as the boards. 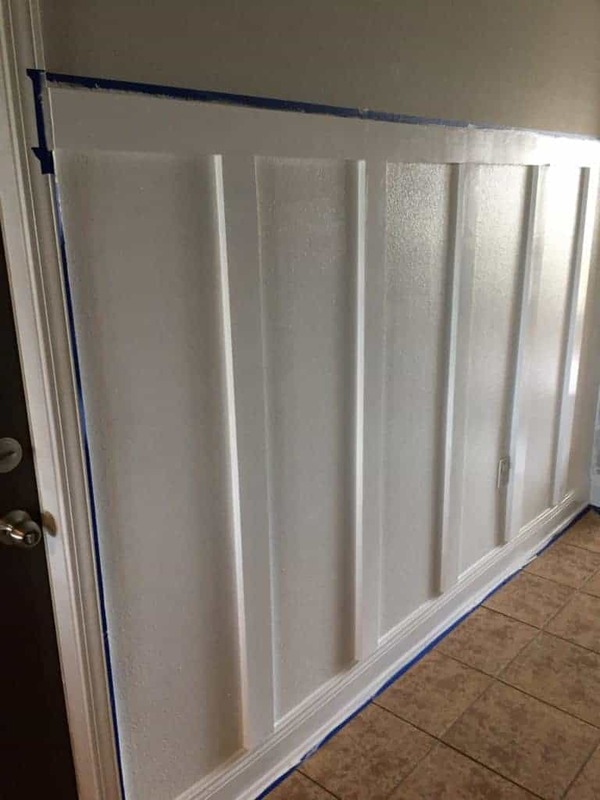 I know a lot of you are thinking, “well this isn’t really board and batten then,” but A LOT of people are doing it this way and for me this is what worked! 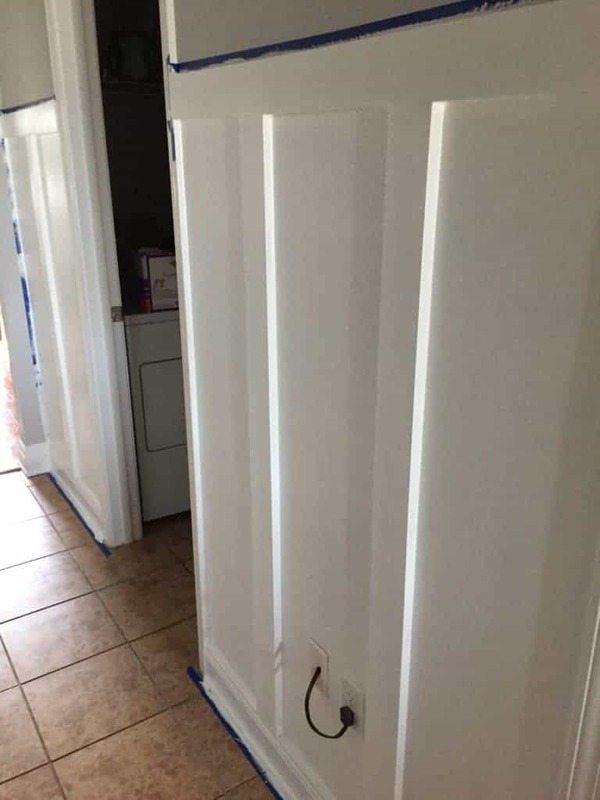 Also, I went back and forth trying to decide whether I would remove the existing baseboards so they would match depth of the vertical board and batten boards. I ultimately decided not to do this, and even though I was so worried I would regret that decision, I’m very pleased with how my results turned out. 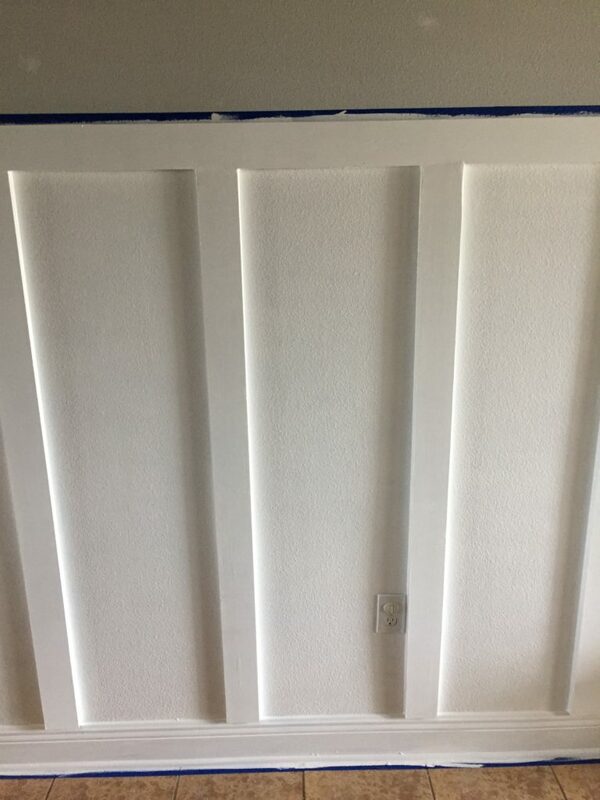 My first step in this EASY DIY BOARD AND BATTEN process was to measure the walls, figure out how many vertical boards I wanted, and measure out exactly how much material I needed for the horizontal boards. 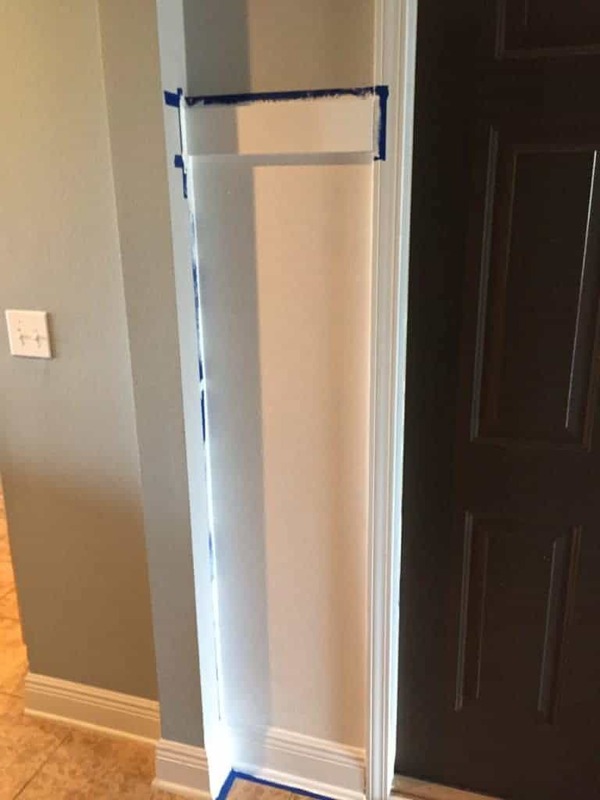 Measure the area you are working with and decide how many vertical boards (I decided on 56″ tall boards) you will need. Note: the distance between each of my boards is not exactly the same. They are each about 15″ (give or take an inch) from the end of one board to the beginning of the next. The reason why they are not exact is because I tried to work around the outlets and light switches. Measure how much material you will need for the horizontal boards. 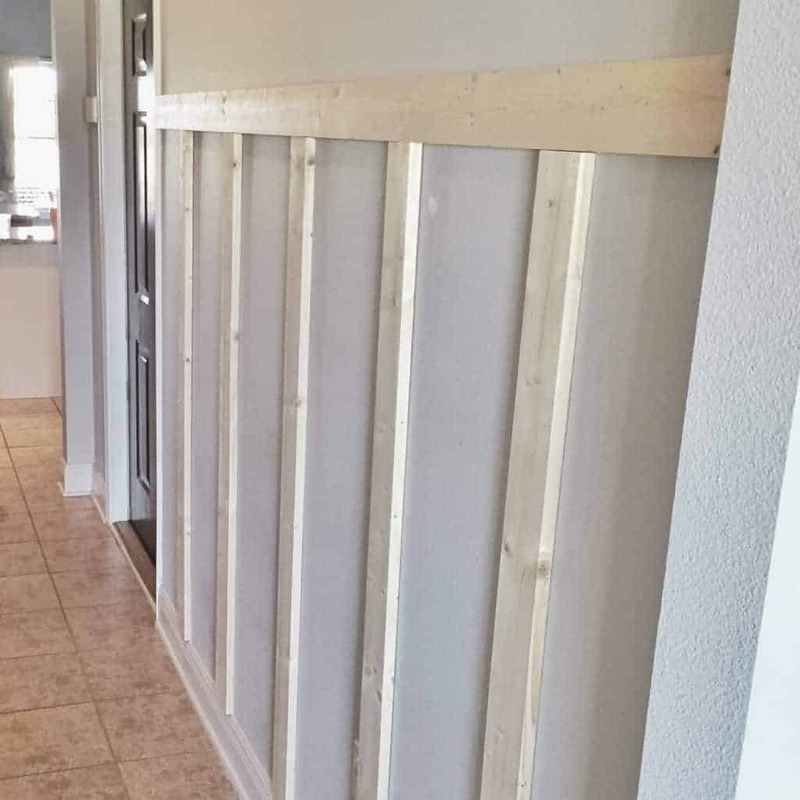 attach the boards to drywall with construction glue and a nail gun (this required an extra hand). Here is a gallery of the process. Scroll right to see more pictures. Try to buy the straightest boards you can find. 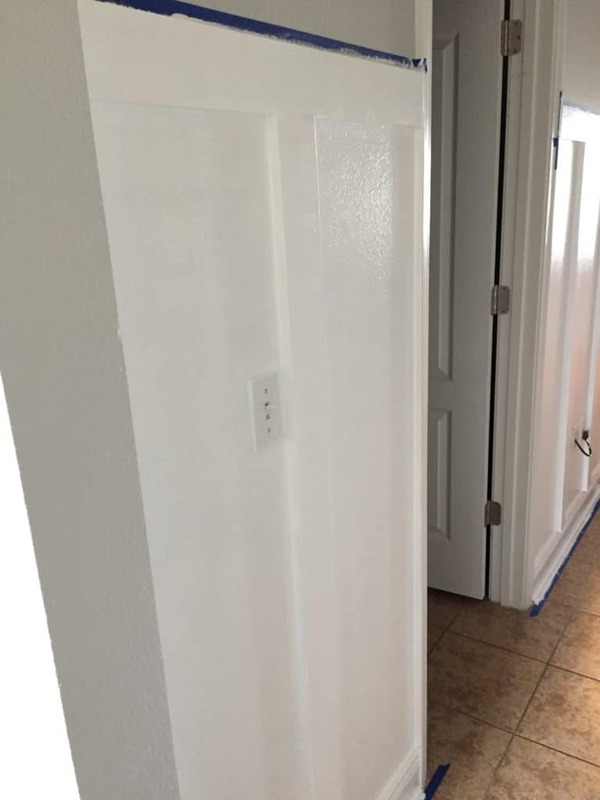 If not, the boards will not lay flat on the drywall and it will require a lot of patching and caulk. When measuring how many vertical boards you will need, try to work around the light switches and electrical outlets. This prevents you from having to make more cuts. A lot of people use different width boards. Like the vertical boards would be a 1 by 2 and the horizontal boards would be a 1 by 4. My theme for this project was simple, so I stayed with one width and although I was worried it would look to plain, I’m real happy with the outcome. When purchasing the hooks, keep in mind that you will be hanging heavy things from them, so make sure they are heavy duty! A link to the hooks I purchased is in the materials list. I had this sign made from a company on Etsy called Vintage Metal Co. They did a fabulous job! That’s it! 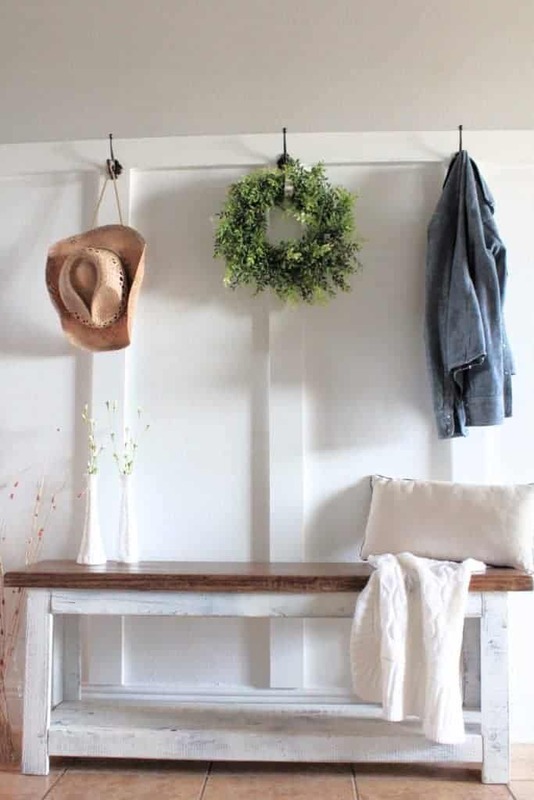 I love the way my DIY BOARD AND BATTEN (or wainscoting) creates a nice Modern Farmhouse Mudroom. It’s really nice to walk into a more organized and lovely space. Isn’t it funny how a few 1 by 4’s and a few hooks will transform a space. Did you enjoy this post? If you did and want to save it for later I would love for you to pin it to Pinterest with the image below! To see more easy and affordable home updates click HERE. Note: the highlighted materials below have a link to the product for your convenience. This is an affiliate link, which means I make a commission off of your purchase, but in no way does it affect the price you pay. 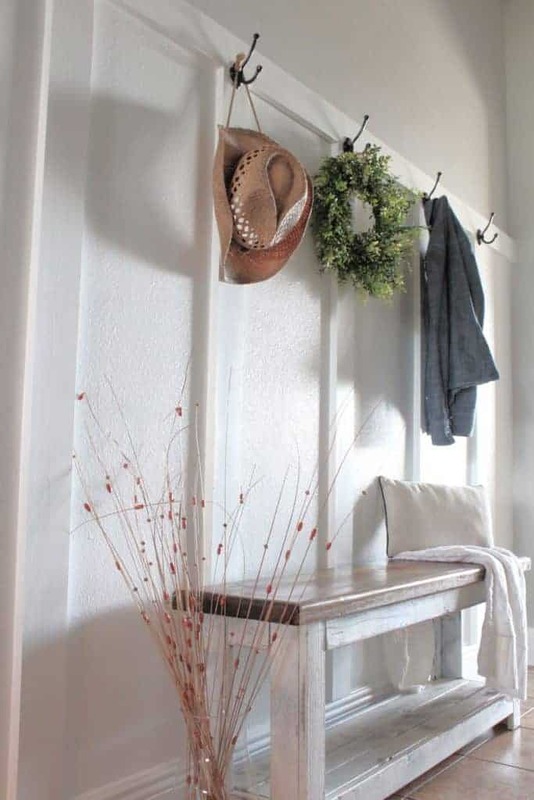 Think that you did a great job and it looks like much more than a simple mudroom. Thanks so much Cordelia! miss you, maybe we will see you soon. Have fun with mom and dad! Beautiful! This would be great in my entry way too! Thank you Charlene, It was easier than I expected to complete, so you should definitely do it! It does look beautiful, you did a great job. Thank you for sharing at The Really Crafty Link Party. Pinned! This looks so easy but still super pretty! Thank you for sharing! Love it. I have been describing to my husband how I want our back entrance. This is going to help alot. Great job and I dream ours turns out this nice. Pinned. It was actually easier than I thought to complete. Good luck. I would love to see how yours turns out! Turned out just beuatiful! Thanks for sharing with us at the To grandma’s house we go Wednesday link party! Hope to see you there tomorrow! Genius! I am pinning this project and doing it. Thank you so much! 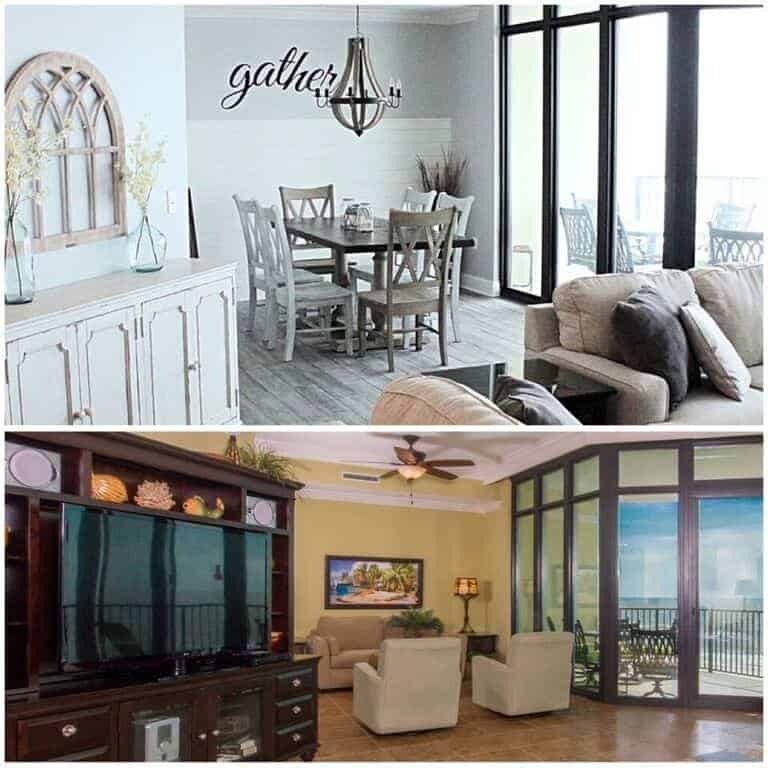 I love the board and batten look and how you styled the finished project! looks fantastic! Looks great!! I am such a fan of board and batten. 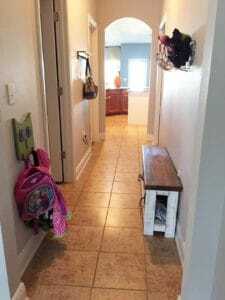 It makes such a huge difference in your hallway! I will be pinning this one:) Found your site through the linky party! Very nice! Love the chalkboard and how it all came together. It looks amazing!!! 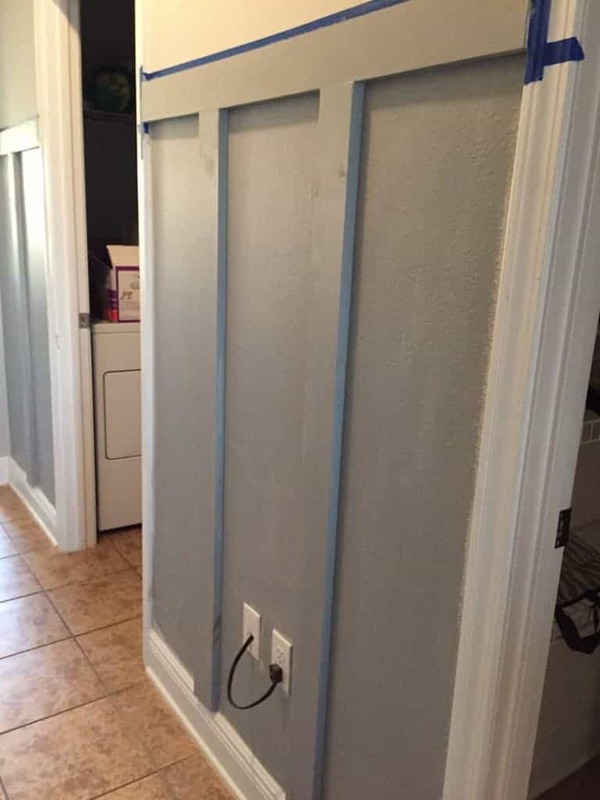 You did a great job and it takes your mudroom to the next level! 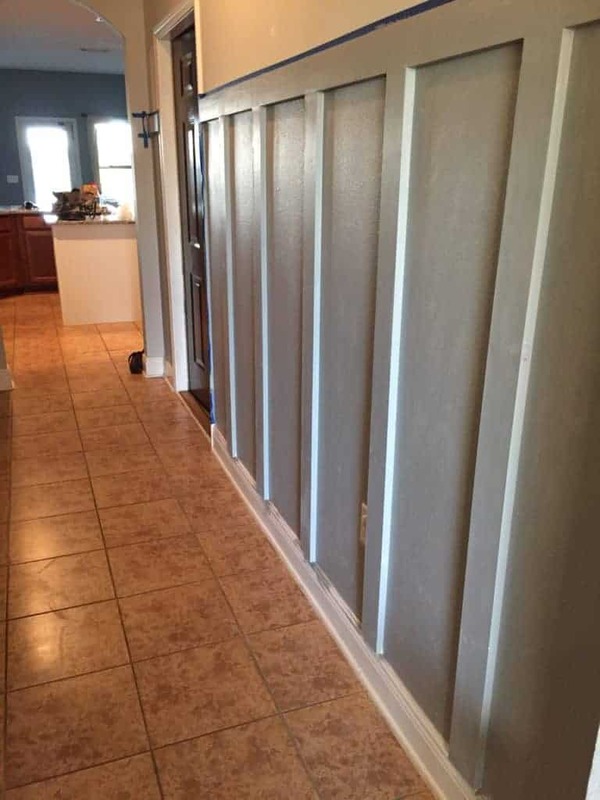 I love your “faux” board and batten! It looks fantastic and really made the space pop! As long as it works for you without adding the batten boards, why not? Thanks so much for sharing this great project at Celebrate Your Story! This looks lovely! Add so much character to the space. It’s amazing how it really adds to the space. 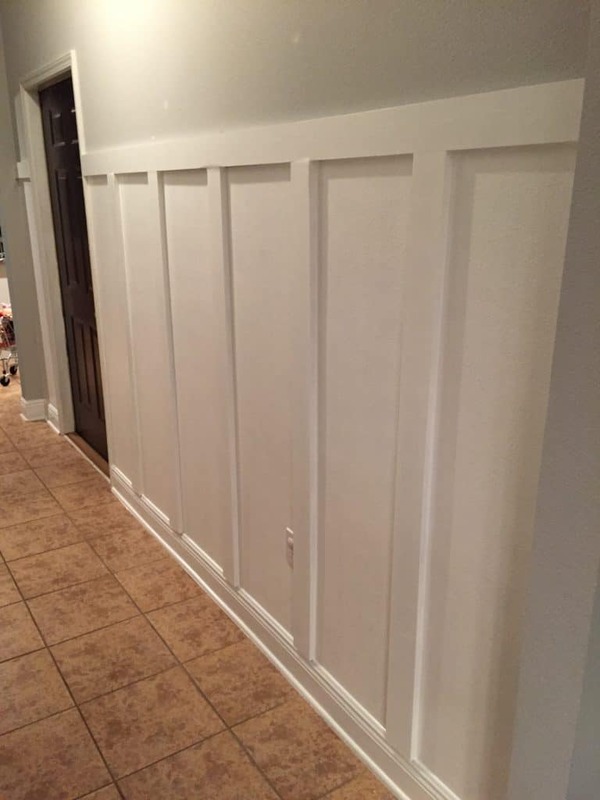 Your board and batten wainscoting looks like it was always meant to be there and your tutorial is excellent. I am a big believer in adding architectural detail. 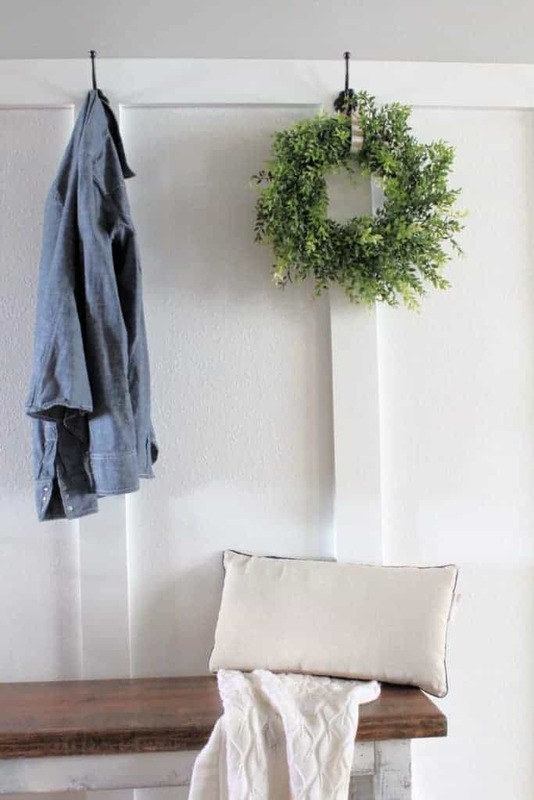 It’s amazing how inexpensive DIY projects like this can complete transform a space. Great job! This is absolutely gorgeous! I love the board and batten but you also did an incredible job with your decor. Stunning makeover! I love this look. You have proven that it doesn’t have to be difficult to create something like this. Sometimes simple is best! YES! trust me I’m no carpenter, so if I can do it, anyone can! You make this look so easy I think I might be able to actually do it, too! Thanks so much for sharing at the #happynowlinkup! I love this and I think this would look fabulous in our entrance area. It´s a small wall I have available but needs something like this and I had no idea it was that easy actually. I really love how you styled it and added the hooks. So beautiful. Thank you Katrin, it really has transformed this space for sure! This is great! I love how simple and modern it is. Very pretty! A stunning transformation! 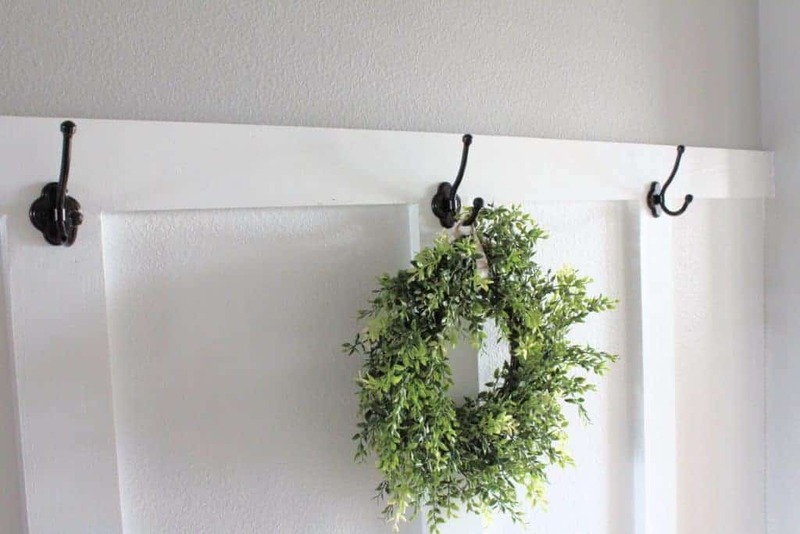 You made this DIY project seem very approachable and relatively easy to achieve. Thanks for the tutorial. Pinning! Featuring this awesomeness tonight. Pinning and sharing on FB too. Have a great week. Thanks so much Stephanie! Have a great week. The old area definitely did not look bad but the new one is fabulous. Looks fantastic! 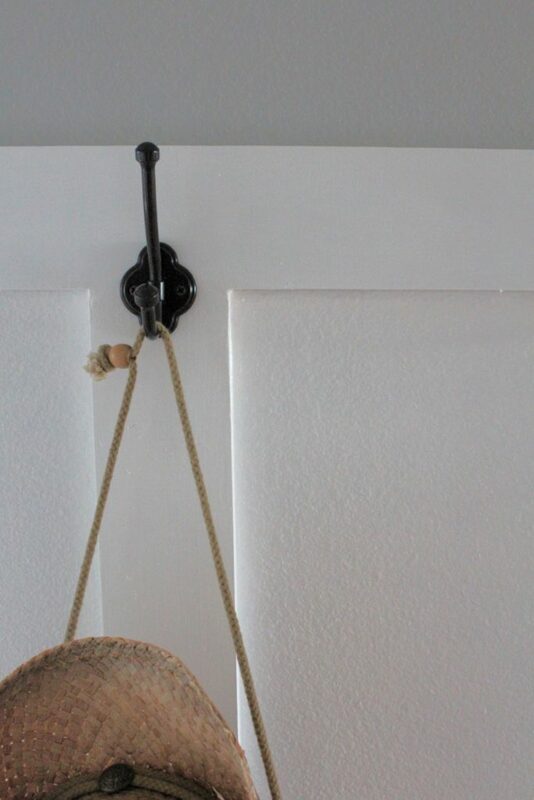 I’m researching easy board and batten ideas for our cottage and am liking this approach. Thanks! 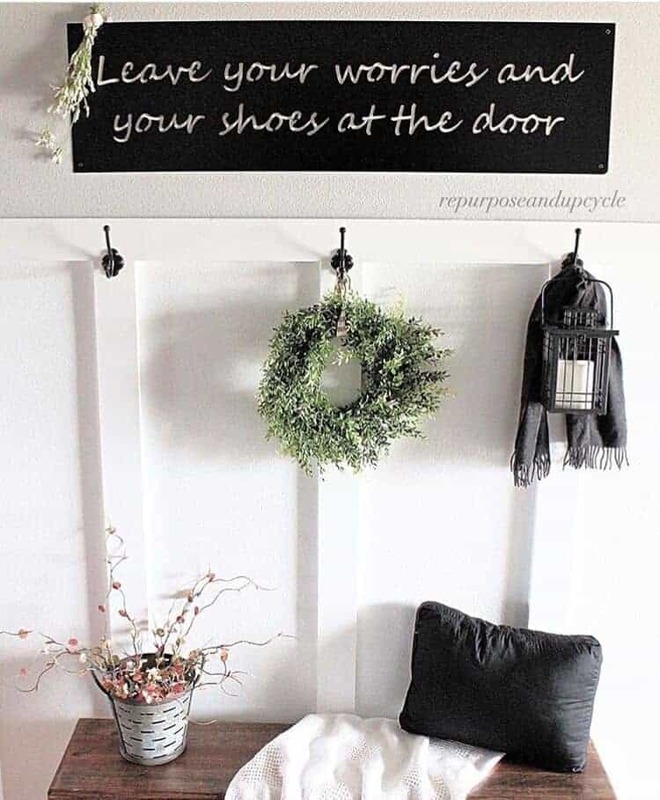 I simply love this look for an entry or hallway, and such a great tutorial Lindsey, thanks for sharing it at #FridaysFurnitureFix, pinning for a future project in the house! Love the board and batten look. 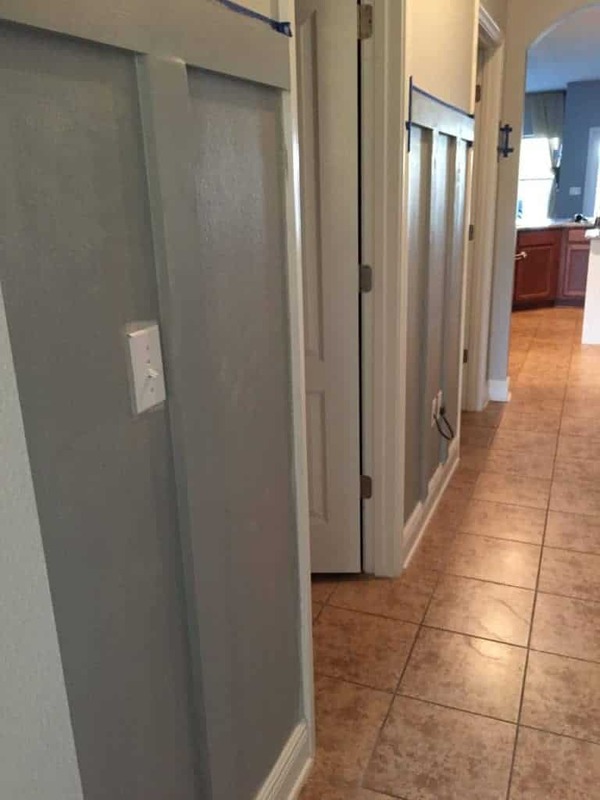 Could you please tell me the paint color you used above the board and batten. Sure! It’s Stonington Gray by Benjamin Moore. Almost my entire house is painted in it. It goes well with all different color palates. 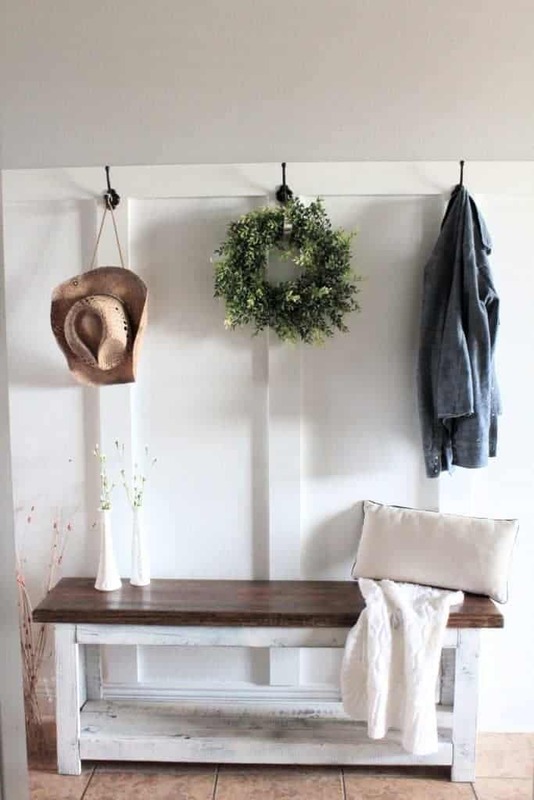 Love this update to your mudroom Lindsay. Thank you for sharing at Create, Bake, Grow & Gather this week. I’m delighted to be featuring this at tonight’s party and pinning too!! I did not make the bench, sorry. Glad you like my DIY board and batten.